Sponsored by Zend and developed according to American National Standards Institute (ANSI) standards, Zend Certification programs are designed to test a candidate’s level of knowledge in PHP or Zend Framework without prejudice to other technologies. The tests use a set of testing questions that reflect real-world scenarios, including knowledge in many areas ranging from basics to the more complex topics. The certification exam is executed for Zend by Pearson Vue. 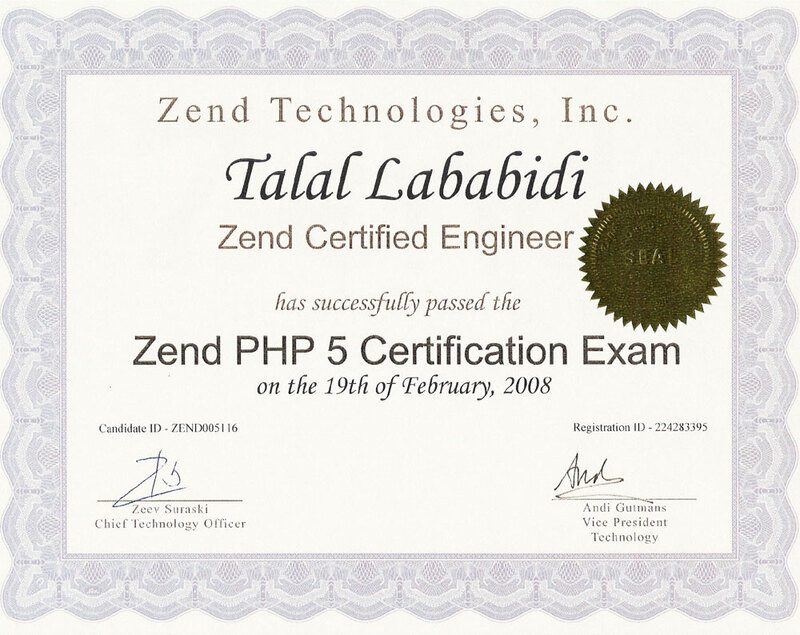 Two years after launching the industry standard for PHP Certifications, Zend has once again teamed with a group of leading PHP experts to bring you the “Zend PHP 5 Certification” exam. The new certification exam has been completely rewritten, and is a completely new exam, not just an "upgrade" of the previous version. The exam is created by an Advisory Board made up of thought leaders in the PHP community. Because the exam is created with specific skills, knowledge and competencies that are matched to real-world job functions, Zend Certifications provide a measure of technical distinction that employers use to evaluate prospective employees.